Last week my friend Vitaly greeted me with a sudden handshake. He had returned from Russia for the funeral of his father, who had died on Christmas. I had given Vitaly a simple card on which I copied lines of Rumi's on grief. It was clear that Vitaly was reeling from the experience. On the way to Moscow, he said, he had to be strong. Now, on the other side of the world and his father’s life, he was sick and physically exhausted, and only now was the enormity of his grief flooding in. In my sterile cubicle, Vitaly shared that he had never lost someone so close. We didn’t say much, but I knew what he was feeling. We both had lost sick and elderly grandparents, aunts, uncles, but until recently neither of us had come so close to death. Vitaly described how he spent New Year’s with his eighty-eight-year-old grandmother, drinking champagne and watching fireworks explode over Moscow. I wondered what rituals he may have participated in and what outlets might be available to him now that he was back. The geography of his experience, the sudden flight alone into the realm of his past, struck me as the story we all share in this time. Modernity has buried the old ways of initiation and provides no sure path to mastery. Those who in previous ages would have become elders are now locked away in institutions full of close supervision and technical know-how. Our youth can work all sorts of entertaining technologies but take longer and longer to become true adults, if they do at all, with few qualified to guide them along the way. We’ve forgotten the natural world and its animals, who are in many respects our superiors. We are immigrants in a cold, unyielding land. Last year was marked by further travels in the outer and inner worlds. Like Vitaly, I had flown to the other side of the earth, into another time and place. Last May, while Vitaly visited his father for what would be the last time, I walked leaf-strewn streets in New Zealand. 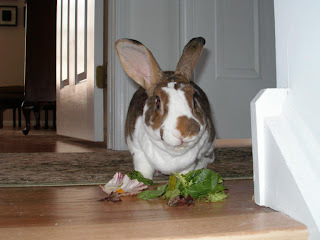 I returned for our rabbit’s last summer; and for the last two weeks of his life, Jenifer and I watched over him day and night, gave him the medicine he hated taking, held him upright so he could eat, drink, and relieve himself. October J was both child and elder, both dependent and wise beyond measure. He showed us the truth of Amma’s words, that nothing is a burden when there is devotion. We slipped out the door and into the first snowfall of the year. We crossed the parking lot, and I headed for the bordering trees. “Where are you taking me?” Vitaly asked. “To my secret place,” I joked. We went up a short embankment and under a canopy of pines to the Quaker meeting house just beyond. I said that it was old and Vitaly said that nothing in America is old. He was right, of course, and as we took shelter on the front porch, my common retreat, he noted the meeting house’s year of establishment: 1871, one hundred years before his birth. Vitaly smoked and I looked across the street to the silent Quaker graveyard, to the snow-grey atmosphere haunting the surrounding woods. We said little, watched the falling snowflakes, and remembered sunnier days. It was a good start. Rumi is good medicine. A quiet moment in a secret spot is another. And creation is the best medicine of all.